All incoming/outgoing DNS is blocked on all gateways. Only HTTPS traffic is allowed to escape. Internal DNS (port 53) is allowed. I've had pfSense be the main DNS server but things like reverse DNS, AD Integrated DNS, dynamic secure updates, etc… end up having issues. So it's best if I leave the MS AD/DNS/DHCP server as the main. Here's a sketch for some visuals. * I'm not too worried about performance. Once you hit a site, it's cached. Next queries are almost instant. You have to choose DNS resolver and then check forwarding. 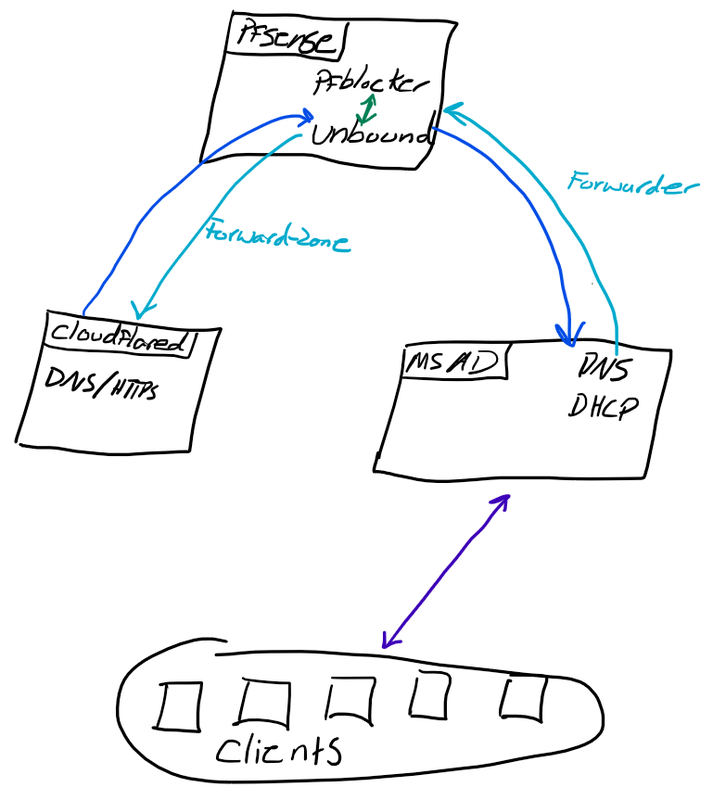 If you choose DNS Forwarder, you dont use unbound but dnsmasq. I'm using the DNS resolver already. And instead of checking the forward box, I've specified custom forward parameters. Did you change DNSBL VIP? By default it's 10.10.10.1. Nope, still the default. And I've configured the firewall rules. If I browse to the ip, I see the 1x1 pixel gif. This address should be in an Isolated Range that is not used in your Network. Changes to the DNSBL VIP will require a Force Reload - DNSBL to take effect. @ronpfs Oh, that is actually not a problem. I changed all the IPs in the config to 10.10.10.x for obfuscation. My LAN/VLANs all use the 10.100.0.0/16 range. So the VIP being on 10.10.10.1 isn't an issue.